Living with friends can be lots of fun but you will all have to clean up and pay bills, so try and share with friends who are responsible and considerate too. Before you sign a contract double check with your friends that you still want to live together and that no one is having second thoughts! Accommodation is available at any time of the year but the busiest house hunting months are normally November, December, January and February. However, you don't need to look for accommodation that early. If you wait until Easter or the summer you may get a better deal. Decide what is most important to you. Is it Location? Price? Size? House, Flat or Private Hall? Make a ‘wish list’ and work out what your priorities are before you start house hunting. Work out a budget and decide how much you can afford to pay in rent and living costs. This is how much you can expect to pay for student accommodation in Manchester. 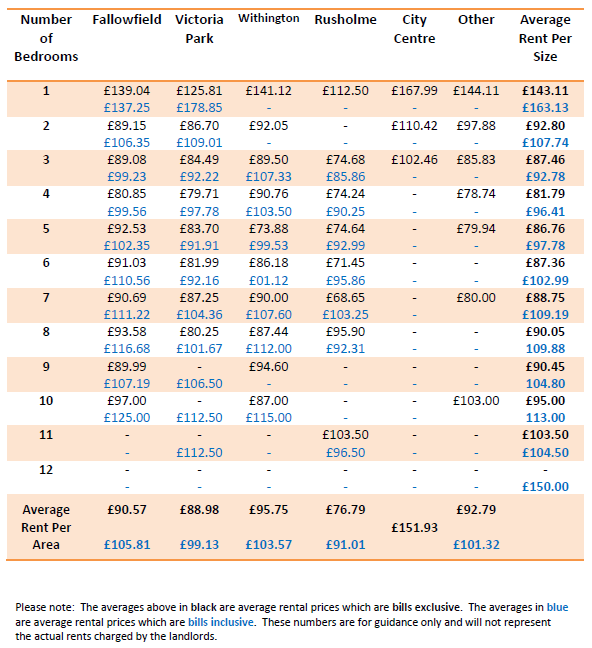 The average rent levels based on last year's figures to give you an idea of what you can expect to pay. These figures are from the Manchester Student Homes 2017-2018 advertising period and are to be used as a guide only. Download a copy of the Average Rent 2018-2019 document here. £10-£15 extra per person per week should be enough to cover Gas, Electric, Water, Internet and TV Licence but this will depend on how much you use. Some landlords offer bills inclusive contracts but it will work out cheaper to manage the bills yourself. Usually landlords charge between £15 and £20 extra per person per week for inclusive bills. Bills inclusive does not normally mean unlimited use and most landlords will include a fair usage clause in your contract, please see the Contracts & Deposits section. Lots of students live in South Manchester in areas with good transport links to the Universities such as Fallowfield, Rusholme or Victoria Park but there are plenty of other areas that are popular with students. Please see our Area Guide for more information. How far will you be from bus, tram and cycle routes? Oxford Road and Upper Brook Street have regular bus services to the Universities and the City Centre. The nearest train station to the Oxford Road University Campuses for The University of Manchester and Manchester Metropolitan University is Oxford Road Station. Whilst the nearest tram stop is St Peter's Square. Our standards are much higher than the requirements of other accommodation websites because we only want students to rent from good landlords and agents. Make sure they are accredited by Manchester Student Homes. Try to go to property viewings as a group and be aware of your own personal safety. Make sure someone knows where you are and take your phone with you. Think about how safe the area feels. Would you feel safe night walking alone? You can also pop into our office to pick up freebies such as light timers, safety information, personal alarms and much more. If you want to know how many crimes have been reported in a particular area, you can put the postcode into the Police Crime Map. Are there any signs of damp, disrepair or pests? Is there a burglar alarm, smoke alarm and security lighting? Are the furniture and carpets in good condition? How many bathrooms / toilets are there? There are lots of things to look out for, a full Property Viewing Checklist and Tip Tips are available to download. Please don’t give any money or personal details to anyone until you are 100% sure that they are legitimate. Only sign a tenancy agreement when you and all your housemates have viewed the property and have all read and understood the contract. Don’t feel under pressure to sign a tenancy agreement or part with any money. Manchester Student Homes offers a free contract checking service and you can also ask the landlord to complete the paperwork at the Manchester Student Homes’ office in Fallowfield. Further guidance about Rental Fraud can be found here.